Charity is one thing, but it’s not the thing Noonday Collection is most interested in. Noonday connects international artisans to markets in the United States. The collection is sold online and through in-home trunk shows, loosely following the Tupperware model that so famously created economic opportunity for a whole generation of women. The idea is that artisans earn fair wages, sellers (dubbed “ambassadors”) earn a flexible living, and buyers can be confident that their purchase supports an ethical marketplace. The model is market driven and for profit. “I’m all about creating empowering opportunities for others. 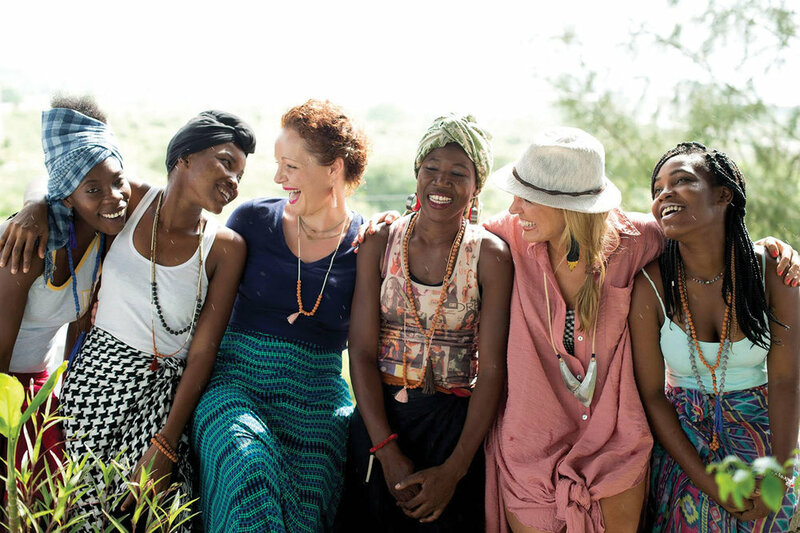 I really believe in equalizing power structures so that we're creating empowering opportunities both for the receiver and the giver,” Noonday founder Jessica Honegger explains. It’s telling that Honegger is not at all sure that Noonday is the giver in the relationship between it and its suppliers. She is sure that Noonday wouldn’t exist if its first suppliers in Uganda hadn’t taken a giant leap of faith in her. It’s only in hindsight that Honegger can confidently say that her mish mash of professional experiences perfectly prepared her to found Noonday. At the time, it all seemed a bit random. After earning a Latin American Studies degree from the University of Texas, Honegger made her way to nonprofit work in Bolivia and Guatemala, where she met her future husband. She then returned to Austin to continue work in the nonprofit sector, overseeing the mentorship program at charter school American Youthworks. Honegger’s early nonprofit work instilled in her a deep belief in the power of education, but she became jaded by the business model and the inequities within it. She enrolled in a Master’s program in education and decided to take a breather from nonprofits by taking a job at The Menagerie, selling jewelry and wedding china—random at the time. As Honegger and her husband settled down and began expanding their family, it became important that they find more profitable work. They began flipping houses and then opened a boutique real estate business. Meanwhile, volunteering remained a key part of their lives, and the two went on multiple mission trips abroad. The financial crisis hit just as they were planning their third child, the first through adoption. With Austin’s real estate market in shambles, the couple struggled to make ends meet, racking up the credit card bill to scrape by. But Honegger wasn’t going to let a little thing like money prevent her from following through on what was really important: family. She decided to get in touch with friends in Uganda who had previously asked her to throw a house party and sell some jewelry made by local artists. She’d declined the request before because she was sure that the event would fail and she would look desperate, but, with nothing left to lose and in serious need of some gains, she decided it was worth a shot—whatever it took to support her family and see her adoption through. “I grew up with a really great dad, an entrepreneurial dad, and he always had us as kids come alongside him to all of his volunteer work. And so, I always remember ringing the Salvation Army Bell in the mall growing up. And I was just like, I don't care if I have to stand at the mall with the Salvation Army Bell or whatever, you know, like we're going to make this happen,” Honegger says. That courage paid off. The event was a clear success, and within a few months it quickly scaled into a business, thanks to a community of women supporters. Honegger’s seemingly random professional path led her squarely to Noonday. The Latin American studies degree gave her language skills and an international awareness, the failed real estate business made her comfortable with risk and honed her business acumen, and the jewelry store experience familiarized her with that market. It all came together with Noonday. But that doesn’t mean it was easy. The collection’s early days were, in Honegger’s words, scrappy. She was networking with other women who wanted to hold events to finance their own adoptions, she was building relationships with her suppliers and seller networks, she was working on creating a scalable model—and she was preparing to bring her new baby boy, Jack, home from Rwanda. It was clear that she couldn’t build the business alone. And this is where luck—or fate, depending on your outlook—came in. She reached out to Travis Wilson, a friend with a finance background whom she’d met on a trip to Africa years prior. Unbeknownst to Honegger, Wilson was saving up to invest in the right socially conscious business initiative. Noonday fit the bill and Wilson became co-CEO of the collection. Noonday now supports 31 artisan businesses in 14 countries, and Honegger says the plan is to expand even further. She has her eye on expanding Noonday’s presence in Latin America, which would put her degree to good use again. But expansion at Noonday isn’t easy. “There's an African proverb, and it says, ‘If you want to go fast, go alone. If you want to go far go together,’ and we really are wanting to go far, which does maybe slow things down every now and then because we're a super collaborative culture and we want buy in from all of our stakeholders and want everyone to feel empowered in the decision-making process,” Honegger says. In some countries Noonday has had to build viable supply networks from the ground up. In others, such as India, there’s a robust fair-trade market that the company has been able to tap into. In all cases, Noonday pays 50 percent up front, knowing that many of the artisans would not be able to deliver without that initial investment for raw materials. Also, in all cases, Noonday is extremely hands-on with its suppliers. The goal is to create sustainable long-term partnerships, rather than flash-in-the-pan opportunity. Though Honegger has a deep conviction that market-driven opportunity is the best way to equalize power across international borders, she is aware of the systemic and structural problems that many of her artisans are up against. For that reason, Noonday does support nonprofit initiatives to, for example, promote home-buying in Haiti or provide water filters in Uganda. But those initiatives are always need driven and are secondary to the main goal of uplifting people through economic opportunity and dignified work. And that impact is not exclusive to Noonday’s suppliers. Stateside, the business is creating flexible employment opportunities for women through its ambassador program, and it still holds Adoption Trunk Shows, from which 10 percent of the proceeds are donated to help adoptive families bring their children home. The office in Austin employs 60 people. These days, Honegger is spending much of her time traveling the United States to promote her book, Imperfect Courage, in which she urges women across the globe to team up and strive to create lives of meaning, no matter how scary that might be. The meaning of the word “give” is different for different people and businesses. For Honegger, the word really is about equalizing markets and power structures, and that’s what Noonday aims to do with every jewelry or accessory sale. If done right, it’s hard to tell who benefits more from the act, who is the giver and who is the receiver. Honegger would be the first to tell you that she has received as much as anyone from Noonday and from the artisans who keep it afloat—after all, Jack’s adoption was made possible through that first trunk show. And there is no better gift than that. To watch the vidcast with Jessica Honegger, become a member of the Masters and Founders Facebook group. It's free to join!